As most of us anxiously watch the path of Hurricane Gustav, satellite images show us the movement of this fierce storm. But satellites and radars are not the only tools that help forecasters predict where, when, and how strong storms will be. In the hours leading up to Gustav's landfall, several teams of scientists slogged through southern Louisiana, deploying weather instruments to get data during the storm. It is information that can both document what this storm is doing, and help forecasters better predict future tropical storms and hurricanes. Two teams from the Texas Tech University hurricane research team spent Sunday placing two dozen sensors in the path of the storm. "Basically the idea is to saturate the area with observation, trying to cover south central Louisiana with these probes," said Ian Giammanco, field coordinator for the research team. The instruments are designed to help meteorologists determine what wind speeds caused what type of damage. Their sensors, seven foot instruments known as "stick-nets," function as complete mini weather stations. "We hope in the future to be able to do this in real time," said Giammanco. But for now that option is far too expensive. The field research is funded by the National Science Foundation and Texas Tech University. Another team of scientists, from the U. S. Geological Survey, (USGS) positioned about 90 storm surge sensors along the Gulf Coast. "From those instruments we want to learn the time, the duration, and the velocity of the surge," said Brian McCallum, assistant director of the Georgia Water Science Center. That information can help forecasters model different types of storms, to help predict their impact. 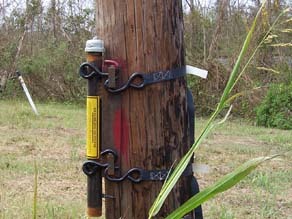 The USGS first placed these sensors in hurricanes Rita and Wilma in 2005. Both the Texas Tech and USGS researchers are hunkering down a safe distance from the coast until the storm passes. They will recover their instruments a day or two after the danger has passed. Calibrate this hurricane, reduce prediction errors for the next one. Better charts, maybe even NOAA error contours ? Research and better forecasting, improve safety. NOAA has very good FAQ. Lot of things, simply answered. Wonder how many instruments were placed on buildings? Saw lots of wind damage to buildings telephone poles, and trees, hope those Citizens who have lots of property damage have the appropriate insurance coverage. If they don't and FEMA doesn't cover them, then the number 1 issue, the National Economy, takes another big hit!! Improved building frames leads to reduced destruction, damages, injuries, lost property, insurance claims, rebuilding costs, and the benefits go on and on!! We )The Construction Industry) already know how to improve buildings for hurricanes, tornados, and earthquakes, but we seem to be waiting for the never ending learning process that always skips the buildings and structures in the process!! The money, energy, wind, temperature, water level, have the same need. Sensors are cheap, some ingenuity, hook up to usb port, send to internet cloud untill sensors drown. What a goldmine of past data for hurricane regression models. NOAA overnight ship to you ?